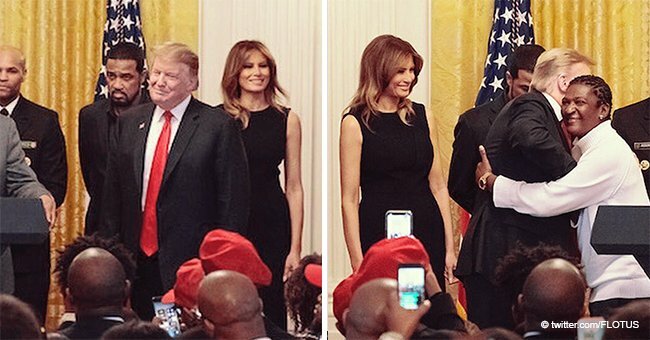 On Friday, First Lady Melania Trump rung in the Spring season by wearing a gorgeous orange and black dress. She was attending a meeting with her husband and other delegates at the time. The first lady’s Aztec patterned outfit managed to turn heads at the Mar-a-Lago in Palm Beach, Florida meeting. Melania Trump, 48, wore a sleeveless colorful print dress with a midi skirt that stopped just below her knees as. The dress was designed by London brand LK Bennett. The dress was cinched at the waist by a black belt and retails for less than $300. At the meeting, she was joined by her husband President Donald Trump and the leaders of the Bahamas, the Dominican Republic, Haiti, Jamaica, and Saint Lucia. The first lady also took to social media to post a number of pictures showing her posing with the Caribbean leaders. She was the main person who stood out because of her outfit choice. 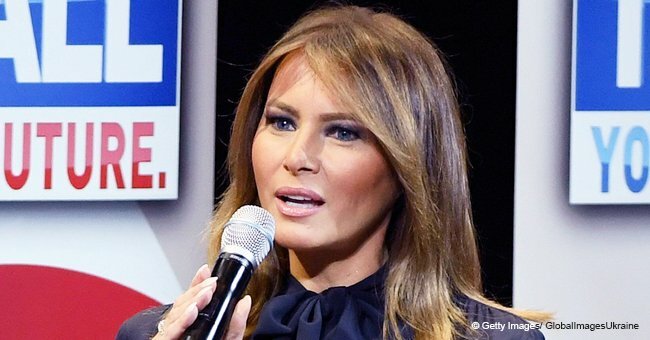 Her spring look was accompanied by bright orange Manolo Blahnik’s BB high heels that featured a snakeskin-embossed finish and she styled her hair in loose cascades. She wore the same heels with a bird-print Erdem dress last summer. In 2017, she also wore them for a trip to Camp David. Trump is generally a big fan of Christian Louboutin pumps but she also loves Manolo Blahnik’s signature BB style. 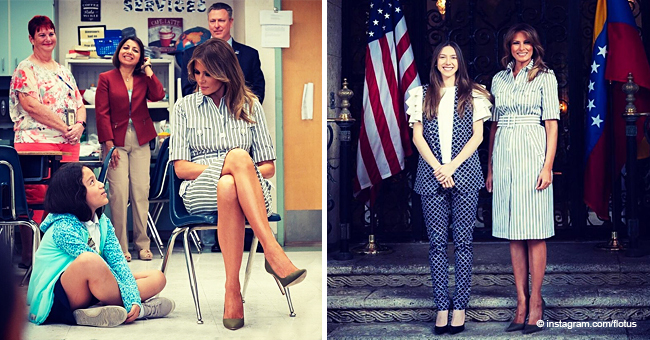 Earlier this month, she started off her “Be Best” tour in Oklahoma wearing a yellow plaid version. The day before the meeting with the leaders was held Trump announced it via her social media accounts. The Trump’s had hosted Jamaica's Prime Minister Andrew Holness, Haiti President Jovenel Moise, Saint Lucia's Prime Minister Allen Michael Chastanet, Dominican Republic President Danilo Medina, and Bahamas Prime Minister Hubert Minnis. The United States president also shared a video from inside the meeting on Twitter.